I was still pretty steamed up this morning over the whole Adidas "Defining Venice" thing (I can't even believe that stupid sign is still up after the Community outrage it's stirred up) as I was on my morning walk. I was thinking about a lot of the comments I got, about how Venice is already dead, and it's a lost cause, and remember the good old days, and all of the cool stuff is gone, and hipsters and techies and billionaires are taking over, and all that ... but you know what? All of the comments were from equally outraged, equally longtime (almost) or native people that are still here, that still care, that still LOVE it here ... so how can it be over? The answer is it's not. This encouraged me as I walked along, and I decided to take a different Canal home today, just for fun. I crossed a bridge and some color on a house up the way caught my eye, so I walked over to investigate. One of the houses had a mural painted (by Venice treasure, Gary Palmer, I found out!) across the top of their place, spelling it all out for me. "The Art Of Being Home." With a beach and lifeguard towers! How perfect for Venice! It's an art just living here. It is our HOME. 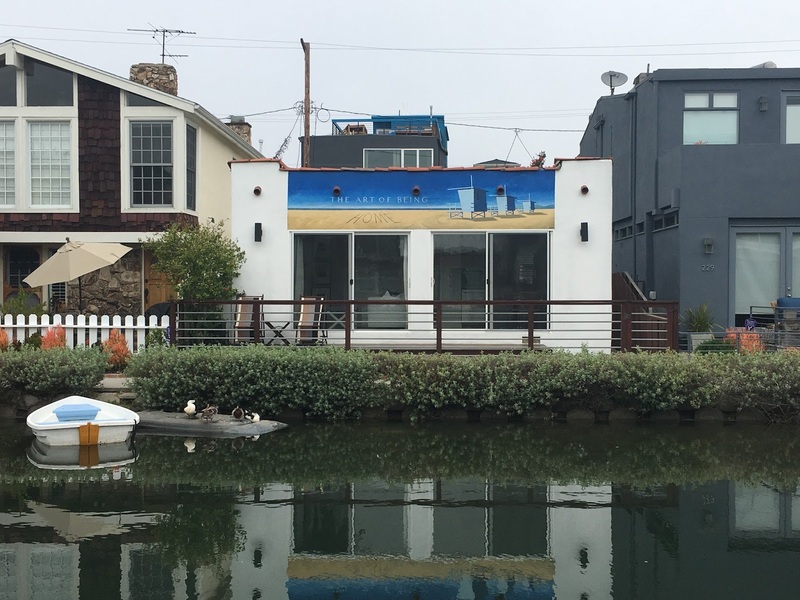 The only reason I/we get so riled up about things like a corporate behemoth thinking they can come in and define our Venice is because we chose to make this beach Community our HOME. Through history, that has always been the thing most worth fighting for ... one's home. It has always been special here, so special that many of us left our own hometowns and families because we were madly in love with this magical place called Venice. It was worth it to us to create our own new lives here far from our loved ones and places. It meant a lot to be accepted into the Community, but that happened because I got involved. I volunteered. I met my neighbors. I made friends with everyone from the most homeless of the homeless to the millionaires (this was pre-billionaires). I went to Neighborhood Council meetings. I shopped locally. I greatly respected all who came before me, and appreciated their welcome. I started this blog to tell all of their stories. To have this place now threatened with becoming like everywhere else is a call to action, a call for principles, and a call for our Community to stand up to it and say ENOUGH. It's not over. It's not too late. Thousands of you feel the exact same way that I do, and told me so yesterday. I'm clearly not giving up. Neither should you. It's (past) time to stand together to preserve what we have left ... to maintain the wonderful art of being home in Venice. Thank you all for letting me know you care like I do. We're still here. I love you, Venice - in complete solidarity.